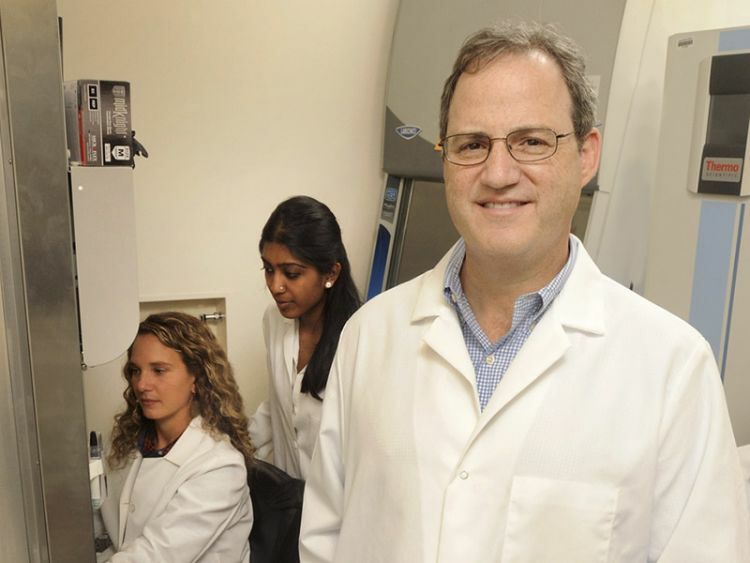 Emory geneticist Stephen Warren helped isolate the gene that causes fragile X. The gene responsible for fragile X syndrome, the most common inherited form of intellectual disability, was identified more than 25 years ago. 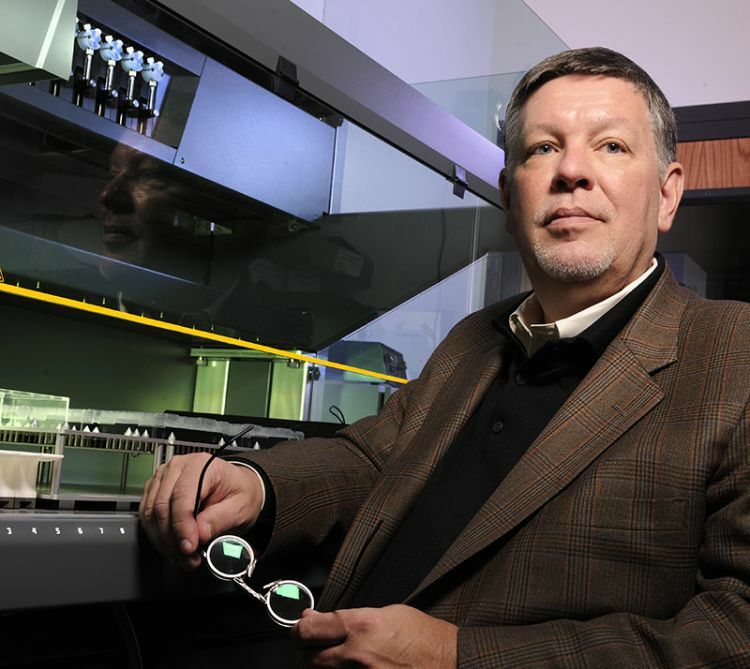 Emory genetics chair Stephen Warren was part of the international team that isolated the gene. The discovery was front-page news around the world, and his work led to insights into the biology of learning and memory. “What we found out about fragile X syndrome was a fundamental change in the way we think about genetics,” Warren says. A genetic disorder caused by a mutation on the X chromosome, fragile X syndrome is rare, affecting about one child in 5,000, and is more common (and more severe) in boys. It often causes mild to moderate intellectual disabilities as well as behavioral and learning challenges. While symptoms of delay are usually noticed between 1 and 2 years old, it takes families an average of 10 visits to a healthcare provider before their child is diagnosed. About a third of children affected have characteristics of autism, such as problems with eye contact, social anxiety, and delayed speech. In fact fragile X syndrome is the most common known single gene cause of autism spectrum disorder. Medical students are often taught about Fragile X and other rare disorders quickly, with little context or depth—little more than a checklist of how to recognize the syndrome in a clinical setting. 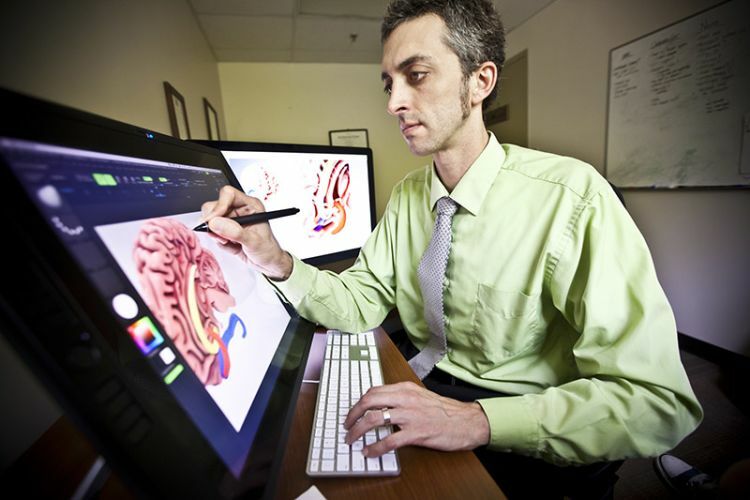 Warren, Amy Talboy, medical director of Emory’s Down Syndrome and Fragile X clinics, and others at Emory are working with medical illustrator Michael Konomos to rectify this. Konomos, head of Emory&apos;s Visual Medical Education team, has assembled an iBook—available free through Apple iTunes—that introduces medical students to the science of fragile X and its history using multimedia. This summer, the iBook won an “Award of Merit” from the Association of Medical Illustrators in the interactive textbook category. The iBook uses artists’ depictions to portray physical markers of fragile X: the elongated face, prominent jaw, and large or protruding ears that can be characteristics of individuals with the syndrome. It contains video interviews with researchers and clinicians, along with animated depictions of how the molecules involved in fragile X syndrome lead to differences in learning and behavior. 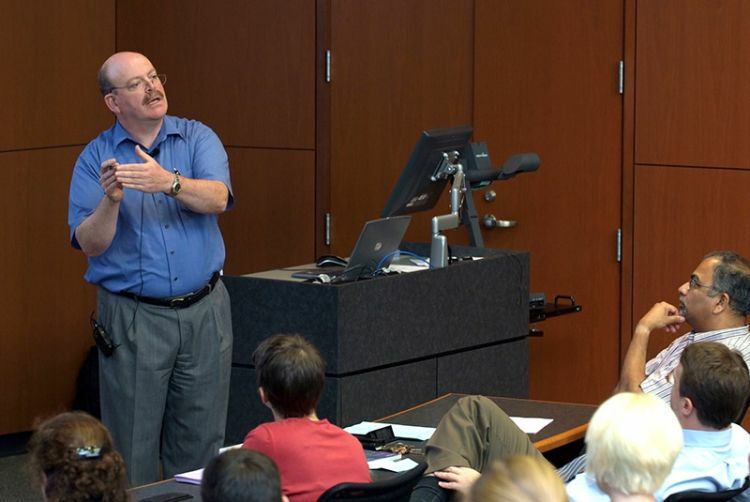 Professor of Medicine Gordon Churchward teaches a group of students at Emory. Medical educators Gordon Churchward and Kathryn Garber brought the iBook into the genetics curriculum for first-year students in the fall of 2017, and are planning to use it again this fall. It’s part of an effort to use non-lecture-based (“flipped classroom”) teaching strategies. In addition to intellectual impairment, fragile X syndrome frequently includes impaired social skills, such as gaze aversion, anxiety, hyperactivity, and repetitive behaviors. In the iBook, Warren describes the “Sherman paradox,” named after colleague Stephanie Sherman, who noticed that the number of males affected by fragile X in families tended to increase generation by generation. For leaders in the field at the time, this well-documented phenomenon was confounding, Warren says. 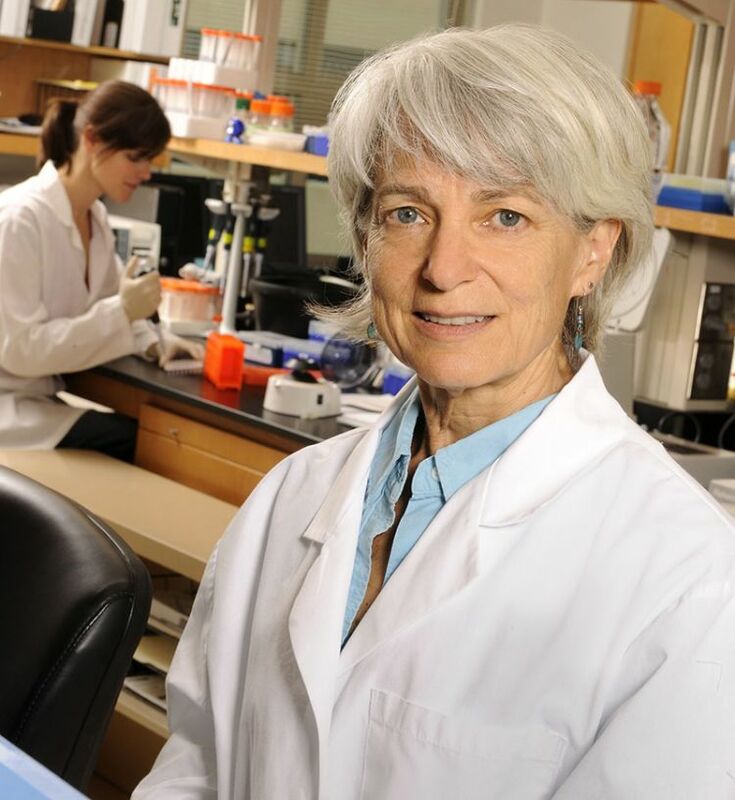 Geneticist Stephanie Sherman discovered the incidence of fragile X can increase with subsequent generations, an anomaly now known as the "Sherman paradox." Fragile X is caused by a genetic duplication on the X chromosome, a "triplet repeat" in which a portion of the gene (CGG) gets repeated again and again. With each generation, the number of repeats tends to rise. So if a mother has a dozen repeats, her child may have 13 or 14. At some point, the repeats reach a tipping point—mothers who have 55 or more often have children with hundreds of repeats—which caused the anomaly that Sherman noticed. For children who pass a critical threshold—more than 200 repeats—the body shuts off the gene (FMR1,) which ultimately causes the effects of fragile X syndrome. Those with 55-200 repeats are considered carriers of the syndrome, and can have neurological decline later in life. This can occur after the age of 50 to carriers of the premutation and it describes problems with movement and cognition. This affects males more than females. In a premutation carrier, the ovaries sometimes do not function properly. These women often undergo menopause and infertility before the age of forty. During the normal CGG repeat, the DNA gets faithfully copied into the daughter strand, but in the someone with the fragile X premutation, sometimes that strand can slip, resulting in a hairpin curve that ultimate results in a replication error and a strand that&apos;s much longer than the parental strand. When this error occurs through generations, the result is fragile X syndrome. The finding was instructive for researchers studying other disorders such as Huntington’s disease and amyotrophic lateral sclerosis (ALS), which also have been linked to triplet repeats. 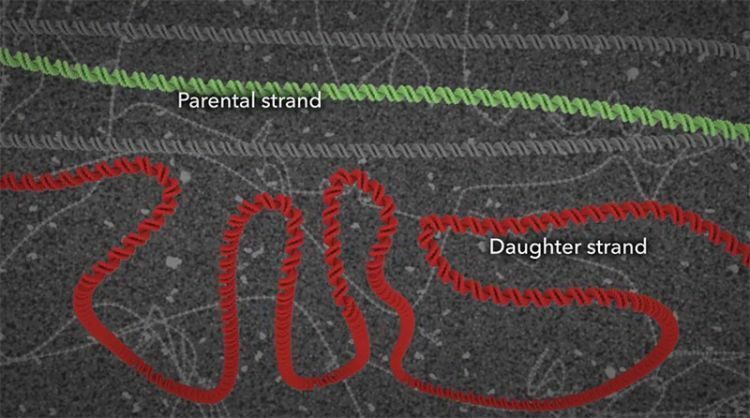 During the normal CGG repeat, the DNA gets faithfully copied into the daughter strand. But in someone with the fragile X premutation, that strand can slip, resulting in a hairpin curve that ultimately results in a replication error and a strand that&apos;s much longer than the parental strand. When this error occurs through generations, the result is fragile X syndrome. 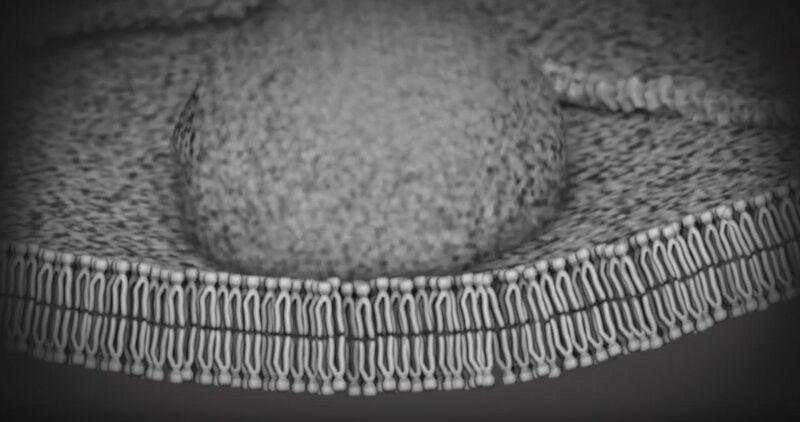 To explain the origins of the genetic mutation that causes fragile X, Konomos turned to molecular animation, a specialty that is becoming increasingly sophisticated. 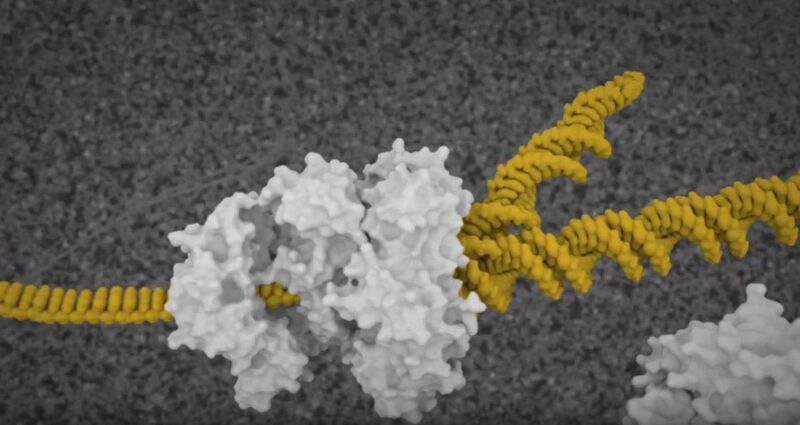 Case in point: Showing how cells’ DNA-copying machinery can "slip" took weeks to get right. 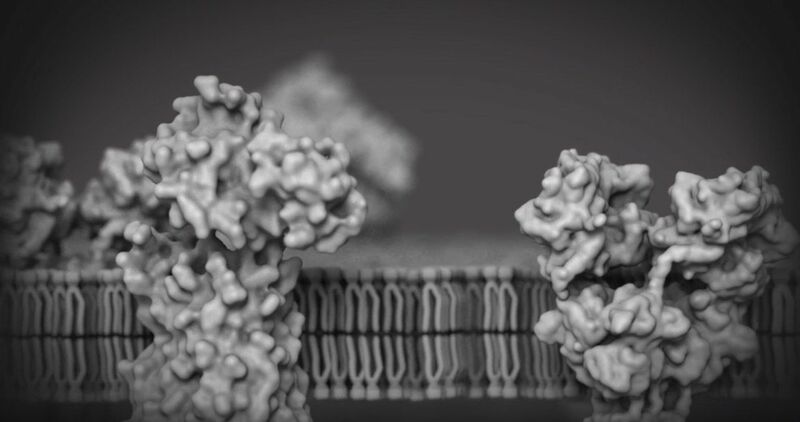 Computer models of relevant proteins from the protein data bank were brought into Cinema 4D, a software used for medical and commercial animation. Konomos taught himself the software along with a molecular plug-in, EPMV. Showing the effects of gene FMR1’s "shut down" on neurons and thus, how fragile X syndrome impacts learning and memory, was even more of a challenge. One scene—a section depicting the alterations of proteins inside the dendritic spine of a neuron—was particularly difficult to pull off, says Konomos. Professor and Chair of Cell Biology Gary Bassell is searching for drug strategies to treat patients with fragile X.
Warren&apos;s work on a mouse model became part of a wave of research on potential treatments. Scientists want to find drugs that could address the specific problems in brain cells that arise in fragile X syndrome. But translating research in mice to the complicated world of clinical trials has been challenging. Emory Medicine ran a 2012 feature on the family of a boy who was participating in a clinical trial for fragile X treatment. "Samuel is a very happy, easy-going, joyful boy," says his mother. He loves trains, baseball, and riding his Big Wheel. Clinical trials like the one Samuel participated in help researchers understand the best ways to measure children’s progress. Cell biology chair Gary Bassell, collaborating with Shannon Gourley at Yerkes National Primate Research Center and his former postdoc Christina Gross at Cincinnati Children’s Hospital, has been developing an alternative drug strategy. They&apos;ve been able to show that their approach can nudge mice with fragile X mutations into more social behavior and more flexible decision-making. "We can’t use mouse behavioral tests alone to understand a drug’s effects," Bassell says. "It is critical to have molecular, cellular, and neurophysiological phenotypes, which we and others do." For his part, Warren thinks that the most effective strategy is likely to be reactivating the fragile X gene. "After all, the gene itself is intact," he says. "There&apos;s nothing wrong with it, except that it’s turned off. That’s what I’d put my money on." 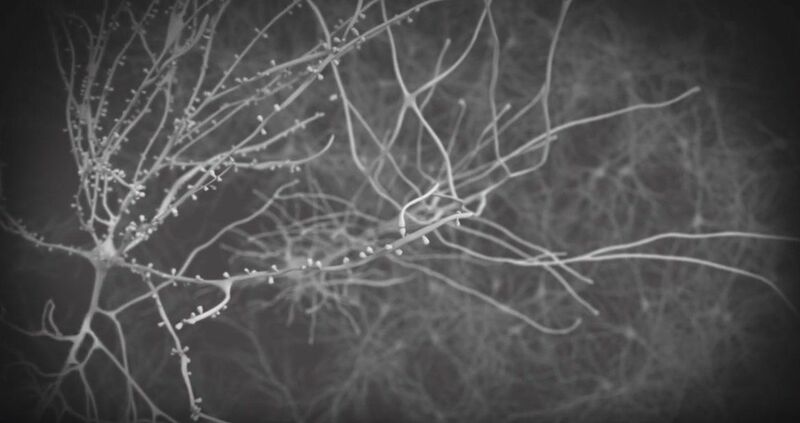 iBook: Fragile X Syndrome, and Emory University.